Colton-Pierrepont Central School’s team, The Colt-allion Stallions, from left, Shiloh DeGray, Chris Edwards, Mark McGrath, and Jed LaBrake. North Country Now Photo by Cheryl Shumway. 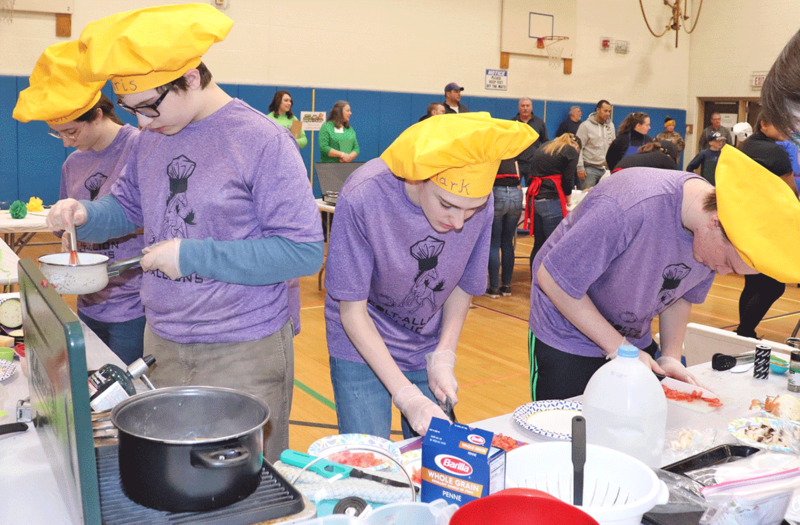 POTSDAM -- A team from Colton-Pierrepont won the sixth North Country Jr. Iron Chef competition in the high school division on Saturday. Students from 18 area school districts chopped, sliced and stirred at the event, sponsored by the St. Lawrence County Health Initiative to encourage healthy, economical and tasty dishes. The event at A.A. Kingston Middle School gym was filled with tables of competitors, many wearing chef uniforms, judges, and spectators. The high school division winning team was The Colt-allion Stallions from Colton-Pierrepont School with their Eggplant Parmesan. The first-place team in the middle school division was Team Voldemort with their Oodles of Noddles Bowl. Judges included Alexandru Stoian, MD at St. Lawrence Health Systems, Amy Conger of 1844 House, Angela Durant of SUNY Plattsburgh, student Claire Rousell of Colton-Pierrepont Central School, Colleen Rielly of Watertown City School District, Jane Bain of Massena Central School, Jamie Cruikshank of Norwood-Norfolk Central School, Jodi LaGarry of Massena Central School, student Madeline Smith of Heuvelton Central School, student Noah Bohl of Potsdam Central School, Rebecca Allen of GardenShare, Steven Maiocco of Dining College Association, Vern Impey of Edwards-Knox and Clifton-Fine Central Schools, and Will Trithart of Big Spoon Kitchen.